This platform was designed around one or more modular sensor bays to support the employment of a multitude of sensors as needed by NOAA’s five line offices. The modular sensor bay was designed to be easily serviceable, with standardized interfaces where possible. 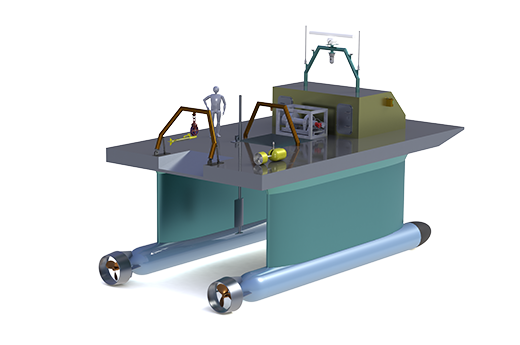 By approaching this requirement with a clean sheet design, we enhanced the power, efficiency, and utility of the platform that would otherwise have been an add-on to an existing vessel. The platform itself is a custom design developed to support the coastal sensing mission for NOAA, but it is flexible enough to allow for almost any sensor to be easily retrofitted, and it will employ sensors for atmospheric, sea/air interface, and subsurface parameters. The design that will come out of this Phase I SBIR will have multiple applications beneficial to numerous agencies outside of NOAA, including the United States Navy and United States Coast Guard.